All Coaches listed below are independent practitioners (unless otherwise stated) and the ILI accepts no responsibilty for the accuracy of their information or their qualifications or competencies. We do however wish you every success and happiness resulting from your work with your coach! Maximum Achievement offers business and personal coaching with a focus on getting as much professional success while maintaining a healthy and fulfilling work life balance. We provide specific support for those wanting to make a significant change in their professional or personal lives. I will be seeing clients in the Ballincollig Healing Centre on Saturdays or evenings after 7pm. I have a Diploma in Psychotherapy and Community Education (UCC) as well as my Diploma in Lifecoaching. I am a Life and Career Coach with 4 years varied experience with a variety of clients. I have also been a business woman for over 20 years with substantial experience in recruiting, training and managing over 300 professional people. My target group are 1) women in business 2) professionals looking for a career change 3) young people entering a career 4) women returning back to work. My emphasis in Life & Career Coaching is on empowering women and professionals to achieve lasting and enriching life and career goals. Empowering clients to successfully identify and action goals across a range of areas including: harnessing creativity, building empathic relationships and successfully navigating transition. Dublin based but work with clients from across the globe, thanks to the wonders of modern technology! Curious to know more? Follow the website link and all your questions should be answered there.Empowering clients to successfully identify and action goals across a range of areas including: harnessing creativity, building empathic relationships and successfully navigating transition. Dublin based but work with clients from across the globe, thanks to the wonders of modern technology! Curious to know more? Follow the website link and all your questions should be answered there. I am a Personal Life Coach and Counsellor and believe that we can all allow OUR MAGNIFICIENCE SHINE and propel ourselves into Action. I give presentations on stress management,time management and life coaching. I also give a night course in the GMIT for people who may be thinking of going back to college to study Arts. Its called Introduction To Social Studies and it covers Philosophy,Psychology and Sociology. I run a personal development course for the Irish Congress of Trade Unions. 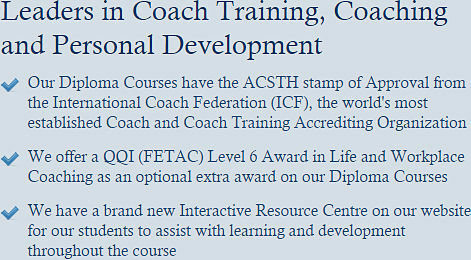 I can award certs to Fetac level six for this course.I am also of course available for one to one coaching. Health Coaching; Life and Business Coach and Trainer. I work with individuals and groups and am passionate about helping individuals to improve their health and personal and professional wellbeing and success. I present at local and national meetings and conferences on health related topics and am certified to work with adolescents and children. Other qualifications include Nutrition, General and Psychiatric Nursing, Family Therapy, Counselling, Communications, Health Service Management and Group Training. Based in Wexford but cover the South east and Dublin. Specialises in Child and Teen Coaching and Career Coaching for Teenagers / Leaving Cert students (CAO forms etc) and also Bullying. I am an NLP Coach whose passion is providing a safe and creative space to explore areas of your life that you would love to change. I will help you harness the skills, gifts and talents you have within you so that you can reach the goals you have for yourself. And if your goal is not yet clear, I can help you find it! I will help you remove the blocks that keep you back. Qualifications: BSc. Diploma in Personal and Business Coaching. ILM Level 5 in Coaching and Mentoring. NLP Master Practitioner in NLP, Timeline Therapy and Hypnotherapy. Qualified NLP Trainer. Claire takes a holistic approach to working with Clients who would like to move forward with their lives. She specialises in giving workshops in authentic communication through mindfulness and presence.  Why does this keep happening to me?  I can’t lose weight, exercise or I lose it but I put it on again.  I don’t have time!  Do you personalise issues?  Do you make assumptions?  I’d love to make some changes but I don’t know how or what I want to change.  I can’t say no.  Why am I being treated this way?  What’s next??? (This usually follows a series of negative situations which have occurred). I am based at the Mallow Primary Healthcare Centre, Mallow, Co. Cork. The Workcoach – Coaching for the workplace. I coach throughout the Munster region. Specialist areas: Relationship & Conflict Issues, Career & Financial. 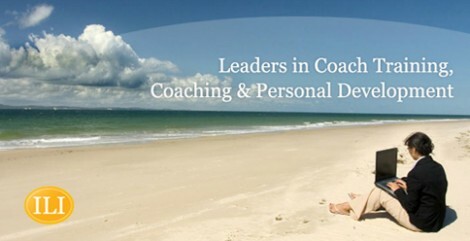 Coaching One to one and group coaching for personal and business development. Face 2 face or via Skype. Personal Development Workshops Designed to inform and tool people up so as to empower themselves on an ongoing basis. Creative Retreats Are exclusively devoted to getting in touch with your creativity – and promise to be extraordinary experiences that you will never forget, impacting you in a profoundly positive way. Coaching with Dorothy will empower you to live your best life. Dorothy will help you see that ultimately only you can change your life. Your happiness and well being are within your control and the fulfilling and rewarding life that you deserve is there for you to create. Let Dorothy help you create and live your best life. Dorothy is also a yoga instructor. My preference is one to one Personal and Life coaching. I have ITEC qualifications in a range of Holistic therapies e.g Aromatherapy, Reflexology, Stress Management, Diet and Nutrition, exercise and fitness. I am a Reiki Master. It's about you, so let's do it! Professional Business, Accredited Career & Life Coach, NLP Practitioner, trainer & award winning keynote speaker. Coming from a background in nursing, I am passionate about self-care, personal development and empowering change. I believe that everyone has the potential to live a happy and fulfilled life in spite of the many obstacles life can throw in their way. In recognition of my work in setting up a self-management coaching program for persistent pain, I was nominated for the ‘Rising Star Award’ by the International Coach Federation (ICF) in 2017. As a former graduate of ILI, I offer reduced rates to ILI Students. My mission is to empower each person to realize & achieve their full potential. I am a qualified Life & Career Coach and also a qualified Trainer. My Business is called: Hand in Hand, Life Coaching & Training Service. I specialise in Career Coaching & Interview Prep offering this service to the unemployed & People in need of a Career Change. I am here to coach and bring awareness to anyone who may be on the verge of having a burnout. I will help them find their work/ life balance again. I also help secondary School Students, learn how to sharpen their study skills. A Business Trainer and Coach, Elaine runs online coaching programmes and workshops on personal and professional development. Do you want to make changes now but don’t know where to start? Coaching can help you create powerful changes in your life. I offer both business and personal coaching for those who want to explore their own potential to it's fullest. If you are interested in arranging an introductory session please get in touch. I specialise in business and executive coaching. I work primarily with business owners, managers and those looking to take the next step into Management. Gareth is a Certified FocalPoint Business Coach and also holds a Diploma in Life & Business Coaching from the ILI. He is a qualified Management Accountant (ACMA) and has a wealth of experience in Sales & Marketing with world class international businesses. His prime focus is to aid businesses manage Time, Team, Money & Exit strategies in order to maximise growth & profitability, whilst minimising uncertainty & frustration. I am currently commuting between Frankfurt and Dublin. International English Business Language Coaching. As well as being a Professional Life Coach I am also a qualified Guidance Counsellor and NLP practitioner. I am certified at levels A and B in the use of psychometric tests. I have worked in the field of career coaching and guidance for over twenty years with school leavers and college students as well as adults. Isabel is a fully qualified Coach in Life and Business and NLP practitioner & Business Practitioner. She was nominated for the Star Award by the International Coach Federation (Ireland). Having coached hundreds of people and accumulating thousands of hours of experience providing coaching and Training/workshops, Isabel’s approach to Business and personal development coaching aims to encourage and build on your confidence and well being, looking after you and your needs as a client as you move forward in your business or personal life. Isabel’s purpose as a Coach is enabling people to achieve their goals personally or professionally and helping them through changes or challenges, we all got them! There is always a solution and together we can find it. Providing coaching in English and Spanish face to face and/or Skype. Image & Style Consultant IICI. I have twenty years experience in the Fashion Industry both in management and trainning. I coach people who wish to achieve a particular result in their life. My objective is to build positivity and confidence within clients. Developing self-belief, along with a clear and managable plan of action, is the way forward to achievement and successful results. My approach is holistic and non-judgemental. Services: personal and business lifecoaching, also diploma in clinical hypnotherapy, neuro linguistic programming, personal development training. Certified member of the International Institute of Training and Development. Lifecoach – Cork City area. I offer individual Life Coaching sessions in Limerick. As a life coach, I aim to help my clients to make desired changes to their lives. I believe in living a meaningful life of joy and freedom without fears. In my every day life and through my coaching practice I endeavor to help and to inspire others to reach out for a balanced and fulfilled life. Personal Coaching and Career Coaching including: Work Searching Skills, CV Preparation and Interview Coaching. My coaching business has taken off in career change and coping with redundancy and change. Others I have supported are clients who are diversifying their business and generating new avenues for growth. Clients have also come with stress and sickness related challenges. Karl focuses people on improving their : Career, Relationships and Living their passion, "Getting out of that stress world and into yours"
Any Kind of positive change you wish to make, I guarantee to help you make it happen by taking the necessary actions. Minerva was set up by Kate Redmond with business experience of over 10 years in the area of Sales, Marketing and Management. Kate is a graduate of the College of Marketing and Design and also holds a Diploma in Public Relations with the Public Relations Institute of Ireland. At Minerva we will let you know our recommendation in our first meeting, working with you, the client to agree the number of required sessions. An initial consultation will be free of charge. This session will enable us to set out an agreed time frame with each client on a case by case basis. At Minerva we are committed to our client’s success and will follow the clients agenda at all times. Personal/ Business Coach. Master NLP Practitioner. The venue for all coaching sessions is determined by the client and a brief phonecall support service is provideed between sessions. The geographic area i cover is Castlebar/Ballina and surrounding areas in Mayo.I carry professional indemnity insurance cover. Executive Coach, presenter, Business Developer,Team Coach, Leadership Coach. Coaching Service: Provide 1 to 1 business and personal coaching. Your Personal Relationship difficulties – family, friendships, partners Your Business Relationship difficulties – work-related Your Relationship with yourself – struggling with change, self doubt, powerless to move forward, whatever the life situation, personal or business. With a passion for human development, motivation and success, I have trained in Psychology, Personal and Business Coaching and NLP, in an academic and practice career spanning more than a decade. Experience of working in the fields of Social work, Education and Financial services industry to Senior Management level. With these skills and experience, I am qualified to use techniques from a range of disciplines to create your individual success formula and propel you or your business to ultimate achievement. Reiki & Seichem Master and practitioner. Máire has been a facilitator of Energy Healing Workshops for the past eight years, runs meditation groups and practices e.f.t. (emotional healing techniques) alongside coaching groups and individuals. Mairead has nearly 20 years of experience within Human Resources and this also includes business coaching both at an individual and group level. She is also available for Life Coaching. For me it's about people, understanding 'you' and your uniqueness, your needs and how you can live your life with you in charge. I work in a number of different ways, from relaxed group workshops, telephone coaching and one to one coaching sessions. This area holds dear to my heart. Having met my husband late in life, I understand the relationship you have with 'you' is key to understanding all other relationships you have with parents, siblings, children, work colleagues, partner, husband or wife. Healthy and loving relationships I believe is the essence of our lives. I work a lot via skype and also phone with clients from all over the world……and my office is at home……so I coach people everywhere. effect positive change and help achieve the kind of life you want. Margaret works with Corporate clients delivering bespoke workshops. Margaret delivers Franklin Covey’s Programme for Teenagers. The 7 Habits of Highly Effective Teenagers. Licensed Franklin Covey Teenage programme. LBCAI CPM, IINLP, Franklin Covey, Fetac. Small groups. Evaluations: Written evaluation of course and further recommendations. Life & Career coaching, location to be specified upon agreement. Health/ Wellness & Business Coaching. I work with clients who are coping with redundancy. I help clients deal with the emotions around redundancy, take stock of their career so far, make decisions about what to do next. Do you find it challenging to stay motivated when endeavouring to make changes to your health? Are you aware that changes must be made in your daily life but don’t know where to begin? I can assist you in becoming more proactive in your daily life and making your wellness a priority. Are you getting the most out of your personal life? What areas of your life could be more fulfilling? Are you being challenged at work to change or perform without the support or resources you need to realise these changes? Course of Practical Philosophy, Psychology and Physiology. How Can I Change So The Situation Changes? I run weekly self development groups on time-management, goal setting, assertiveness and healthy communication. My name is Nuno and I am a Mixed Martial Artist and Black Belt also Mind Coach and Hypnotherapist. I can teach you develop step by step skills to help you to achieve emotional well being. You can think of it as a graded training system to help you live your life successfully. I will take you from a basic white belt to Black Belt in emotional mastery. What you do with that and where you take it from there is for you to enjoy! Counselling Service; One to one client centered sessions. Group Therapy Sessions. Family Therapy. Relationship/couples counselling. Life Coaching Service; Personal life coaching one to one sessions, Personal Development/Self Awareness courses. Confidence building and career choices. Life & Business Coach, Career Coach, NLP Practitioner & Hypnotherapy. The Wellness Centre, Redmond Road, Wexford. Effective career coach, life coach and trainer with over ten years experience in business, recruitment and human resources. Educational qualifications include a BSc in Business Information Systems from U.C.C., a Diploma in Human Resource Management from Dublin Business School and a Diploma in Life and Business Coaching from the Irish Lifecoach Institute. Career Coaching, interview skills training, professional CV review. Patricia Zemmour is a trained and qualified Personal & Business Coach, Dip. from the Irish Lifecoach Institute, Member of the Association For Coaching in Ireland. She has also qualified as an NLP Practitioner and has a focused expertise in career change and career coaching. Are you stuck in a rut? Do you yearn for more purpose and fulfilment in your life? Do you find that you are always on the go but achieving little?. I am a life and business coach with a wealth of experience in coaching a variety of clients from all walks of life. My emphasis is on helping clients to overcome negative habits and limiting beliefs and thus bringing about positive change, goal attainment, life balance and fulfilment. I hold a diploma in Personal and Business Coaching from the Irish Lifecoach Institute and an Honours Degree in Financial Services. I will challenge you to take action but give you the support and encouragement you need to reach your goals. Why not take the first step on your new path and contact me today? I look forward to hearing from you. Coaching for Excellence provides life coaching, personal coaching and career coaching services designed to empower and support you in the most important areas of your life. We coach individuals to success by changing thinking and belief systems and making positive life changes to create a career you love and a life you are proud of. We help you achieve more, in less time. Are you ready to start taking action today? Life Coaching, Parenting Coaching, Trained group facilitator and Business Coaching. Confidence building and self esteem, life stage choices including second third level and career choices. Accredited facilitator for Seven Habits of Effective Teenagers programme. Experience of working with individuals and organisations in statutory, commercial and community sectors. Rachel combines the art of coaching with the science of pharmacy to enhance the customer's experience at the heart of pharmacy excellence. She specialises in coaching and training pharmacists to educate and empower their customers to be proactive about managing their own health and wellbeing. Rachel graduated with a first-class honours Pharmacy Degree in 1995. She qualified with a Diploma in Personal and Business Coaching from the Irish Lifecoach Institute in 2011 and was accredited as a Master Coach by the Coaching Standards Authority in April 2012.
Business Coaching. Staff motivation, goal setting , sales targets, negotiating skills. Time management and focus coaching. How to always ask for the order and close. Leadership and management skills, generating more productivity and profit. Work / Life balance. Personal and business development coaching. One to one and group life coaching and personal development courses, sessions and workshops. Youth & Community sector Coaching Programmes & Personal Development course design and facilitation. Specialising in Fertility Coaching to help identify the physical, mental and emotional factors which affect fertility and reduce their negative impact. Individuals and couples coaching face to face or by phone. I work as a business coach with Health & Wellness Practitioners and Coaches who want to launch their business or step it up to being a key influencer resulting in having a steady flow of your ideal clients, a great marketing and sales system and clear and concise business plan. I am particularly interested in working with young people. As a youth worker with Limerick Youth Service for the past seven years, I have a wealth of experience in working in the area of personal development. I have successfully used and applied my life coaching skills when working when young people in both one to one sessions and group work facilitation. Coaching Service: Life & Business & Personal Development Training Courses. My Coaching clients consist of Personal & SMEs, where I bring my financial background in Banking & understanding of Financial Statements into play. I also provide a Telephone Coaching service. I conduct Pers Dev & Motivation programmes through VEC Midleton in spring & Autumn. I enjoy coaching graduate Coaches. Full time professional life, business and relationship coach with 500+ hours paid experience. Former graduate specializing in the areas of personal development and addiction recovery coaching. Reduced cost rates for ILI students and graduates. Morning , afternoon and evening session times available. Are you beginning to feel stuck? Have you lost sight of where your life is headed or strayed from the path that was once so important to you? Do you have goals or accomplishments that you just can't maintain the motivation to achieve? I do 1-1 and group work – Personal, Business, Performance and Sales Coaching. I work in this field on a full time basis and have been doing coaching since 1993. Full time Life Coach specialising in the areas of relationship coaching and weight loss. Career & Executive Coaching – Do what you Love & Love what you do!eclipsecoaching provides personal & business Coaching services, specialising in Career & Executive development. The coaching programs are designed to achieve success and balance in your life, an enjoyable and rewarding career and excellent relationships. These goals are achievable by everyone and will provide the launch-pad to achieve everything you ever wanted. Our approach will help you find your passion, overcome your barriers and achieve the success you deserve! Elevate (Adventure) Coaching, founded in 2007, is for professionals seeking individual and organisational development. Tricia's vision is to empower her clients to live courageously and authentically. She offers business, personal and adventure coaching. "Looking for Work Life Balance? Trying to find a way forward to pursue your dreams? Do you lack self-belief and need to take control? Have you achieved your personal and/or business goals? Need a change and be excited about new challenges?" Locations covered include, Limerick City and County, Co. Kerry and Cork city and North Co. Cork. Services offered are Life Coaching, Business Coaching and External Work Place Supervision. An experienced Personal and Business Coach. Specialising in areas such as Stress Management, Anxiety, Positive Life Changes, Separation and Weight Loss. Using an innovative approach to help resolve issues and create positive change in a safe, confidential environment.